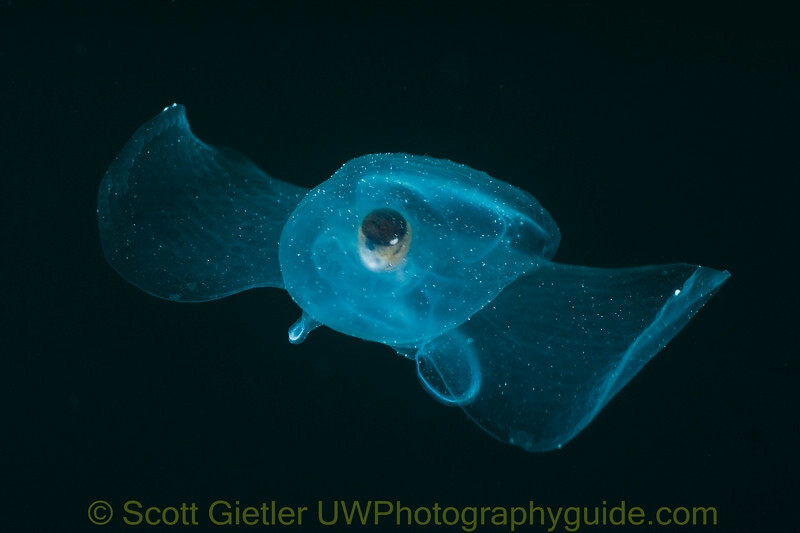 Jellies, Salps, Pelagic Gastropods, and other pelagic marine invertebrates can be exciting underwater photography subjects. 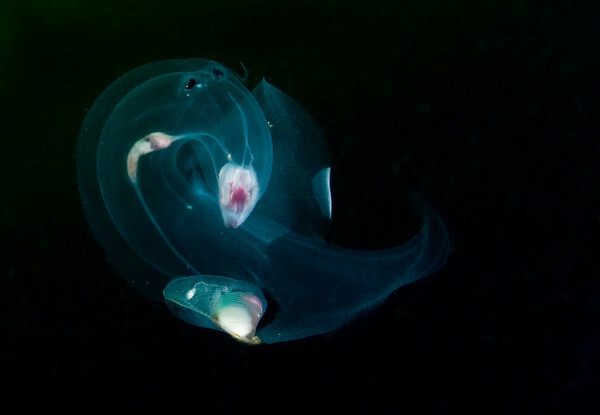 You can see them on regular dives, especially on night dives, or you can go into the open ocean for some blue water diving. 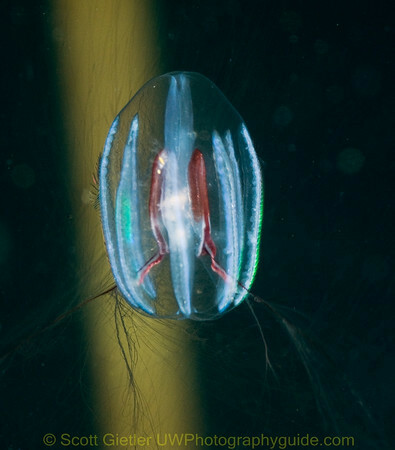 Either way, photographing jellies offers its own unique challenges. Jellies can be very difficult to focus on. Make sure your camera and lens can focus quickly. Set focus to center spot focus. If you are using a dSLR, use a lens with a large maximum aperture, also known as a fast lens. Prime lenses with their own auto-focus motors often focus the quickest. Don't use a teleconverter. Pre-focus your camera before you focus on the jelly. This is very important, otherwise your camera will hunt for focus. 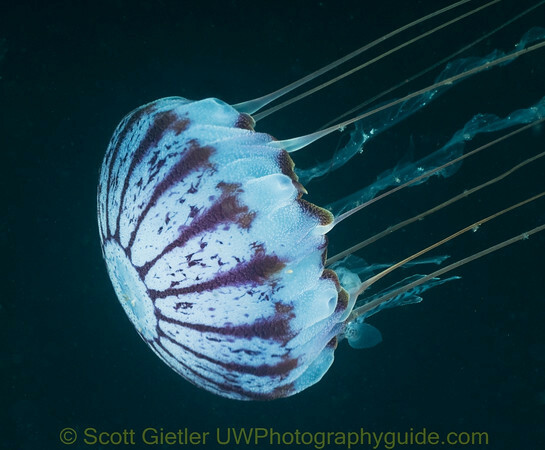 I use the anchor line or my hand/gloves, and quickly focus about 6-12 inches in front of me, sometimes closer if I am expecting to see a smaller jelly. This has helped my shots a lot, and I find myself refocusing on my hand every few minutes. 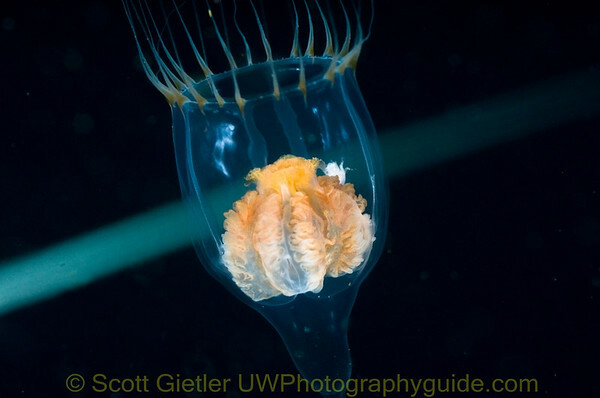 Your camera will have a much better chance of focusing on the jelly if the focus distance is already close. If the focus distance is not close it will just hunt because it can't find any contrast. You are not locking focus, just getting the focus close to the correct distance. 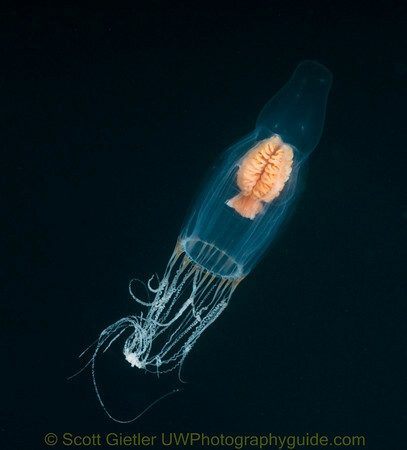 Once the jelly comes into view, press the shutter half-way to allow the camera to fine-tune its focus (in continuous focus mode / servo-mode) and shoot when the jelly is in focus. This works better than pre-setting focus in manual focus mode or locking focus which I've tried. 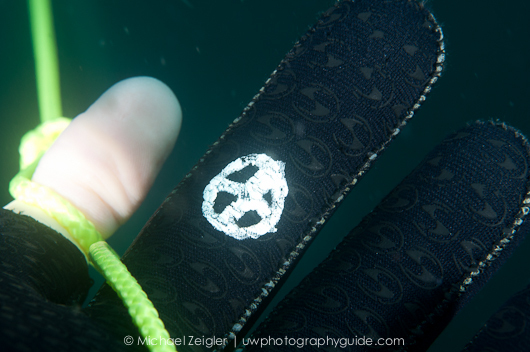 UWPG editor, Michael Zeigler, painted a small "focus target" on his glove which he uses to pre-focus his camera between subjects. The contrast of the white paint and black glove allows the camera to focus using continuous focus mode very quickly. Make sure you use sufficient depth of field, since jellies are usually quite large in all dimensions, and look best when the entire jelly is in focus. 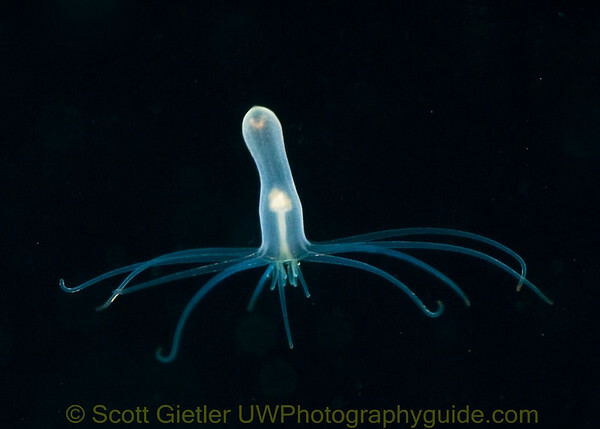 When using my Nikon D300 and my 60mm lens, I will set my strobes on full power and increase my ISO to at least ISO 400 so I can use a smaller aperture like F11 or F14 when photographing the jellies, for maximum depth of field. 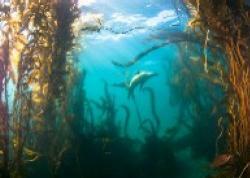 Hang out at different depths to see different species. I like using Nitrox because there's cool stuff at 70ft depth. 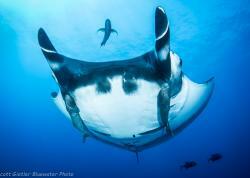 The species at 40ft depth are usually different. Use continuous focusing mode if your camera offers it, so you never have to wait for your camera to lock focus before taking the shot. 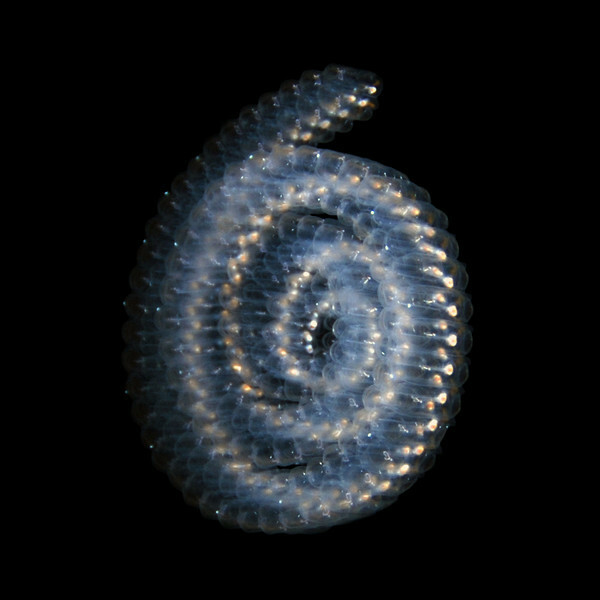 Shoot "upwards" for a bright background, shoot downwards for a darker black background (better for clear pelagic invertebrates). I usually shoot downwards, at the highest shutter speed my camera supports, which is 1/320th for my D300. Use a big tank to spend lots of time underwater, the longer you are underwater the greater the chance of cool invertebrates coming by. 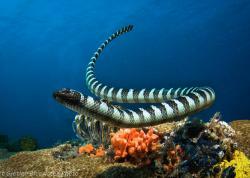 Be careful of backscatter, move your strobes further apart if necessary - keep an eye on your strobe positions. I like to light with the very edges of the beam when there are particles in the water, which can make getting enough strobe power difficult. If you are hanging on an anchor line, and the wind is moving your boat, you may find that the jellies fly by you too fast to get a good shot. 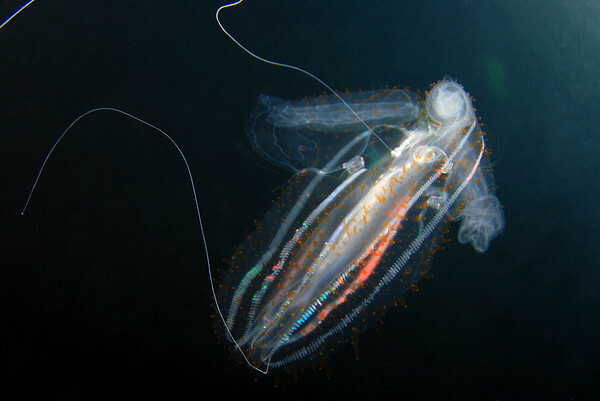 Using a long tether to the anchor line will help, when the jelly appears, let go of the anchor line, photograph the jelly until you reach the end of your tether line, and then swim back to the anchor line, and repeat. This will give you a few more seconds with each jelly. Jelly photos will often benefit from Photoshop. Shoot in raw if possible, and increase contrast and adjust tones, blacks and brightness until you get the proper contrast in the photo. 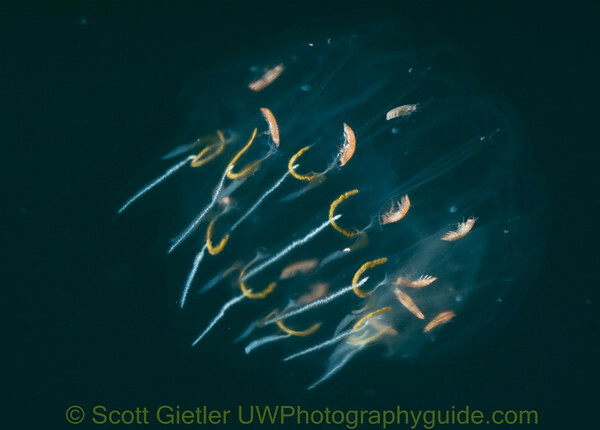 Many jellies will have small amphipods or crustaceans riding on them, take a close look at the jellies. Sometimes it takes a while to notice them. 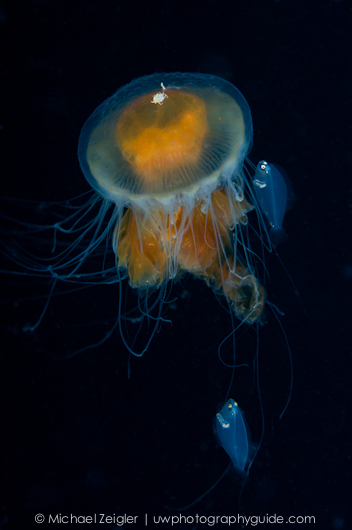 Larger jellies often have small fish taking shelter in the jelly. 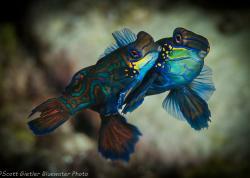 These fish can be hard to spot as they will stay on the "backside" of the jelly, or flee if quickly approached. Again, keep a careful eye out for small fish. I like to alternate between my Nikon 60mm behind a dome port (for smaller stuff 1/2 inch to 3 inches), and my Tokina 10-17mm (subjects 3 inches and larger). I haven't tried my 105mm since the extra working distance isn't needed or helpful, and focusing would be much too difficult. Stick to the 60mm if you are shooting with a dSLR. Why do I sometimes use my macro lens behind a dome port? I find that I don't need/want the extra magnification that my flat port gives me. When I want to focus on the really small stuff I'll use a flat port. My dive buddy tried the 60mm with a 1.4x teleconverter and found it almost impossible to focus properly, and he is very experienced with that setup, so I would avoid using a teleconverter. If you are using a compact camera, you are using a great focal length and will be able to get some good shots, but expect focusing to be difficult. Purple jellyfish sheltering a juvenile Ragfish under its tentacles. F9, 1/320th, ISO 400. There's a photo I took of just the Ragfish here, which according to researchers may be the first non-ROV underwater photo of a Ragfish ever taken. 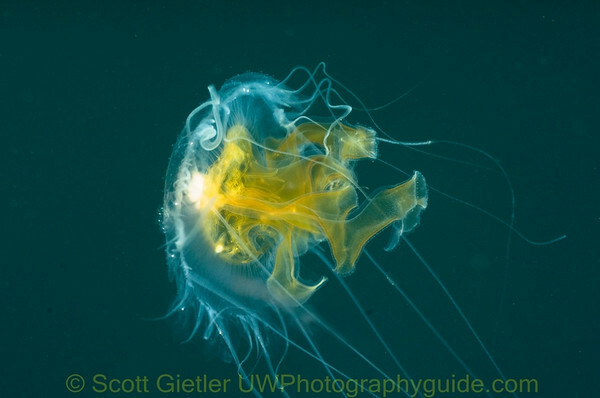 Do you have your own underwater photography tips for jellyfish or pelagic invertebrates? If so, let us know, leave a comment below.